THIRTIETH DAY. --THE HEROIC ACT OF CHARITY FOR THE SOULS OF PURGATORY. The heroic act, in behalf of the souls in Purgatory, consists in a voluntary offering made in their favor to the Divine Majesty, by anyone of the faithful, of all works of satisfaction done by him in his life, as well as all suffrages which shall be offered for him after his death. By this offering he foregoes in their behalf only that special fruit which belongs to himself, so that he is not hindered thereby in praying for his own necessities, or those of others. This act of charity therefore, will not deprive us of any merit. Besides, by resigning all claims on our own works of satisfaction in favor of souls departed, we shall gain for ourselves the special love of God, the Blessed Virgin Mary, and all the saints, according to the promises of Christ: "With what measure you mete, it shall be measured to you again." (Matth. vii. 2.) Furthermore, the gratitude of the holy souls will induce them, in turn, to pray for us in Heaven, so that, we may either escape Purgatory or be blessed by a speedy deliverance therefrom. I. The Indult of a Privileged Alter, personally, every day in the year to all priests who shall have made this offering. II. A Plenary Indulgence daily, applicable only to the departed, to all the faithful, who have made this offering, whenever they go to Holy Communion, provided they visit a church or a public oratory, and pray there for sometime the intention of his Holiness. Prayer: We humbly beseech Thee, O Lord! Graciously accept our prayers, with the indulgences attached, for the suffering souls. We offer Thee, in their behalf, the Precious Blood of Jesus Christ, Thy Son, our Redeemer, and His infinite merits united with the merits of His most holy immaculate Virgin Mother Mary, her ever glorious spouse, St. Joseph, the holy apostles, and all the spirits of Heaven, that by virtue of these merits our devotions may be to them a source of consolation, and open to them the portals of Heaven, there to love, praise, and glorify Thee, world without end. Amen. 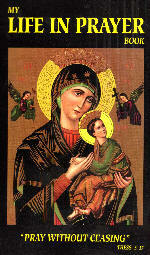 Special Intercession: Pray for the souls, who, while on earth, made the heroic Act of Charity. Practice: Endeavor, every day, to perform an act of charity for the suffering souls.